We then board our bus for transport to Siem Reap. Along the way we witness local Cambodian life, rice fields and stop at Skun, a place where tarantulas and other disgusting things are sold and, more importantly, where they have fine urinals. 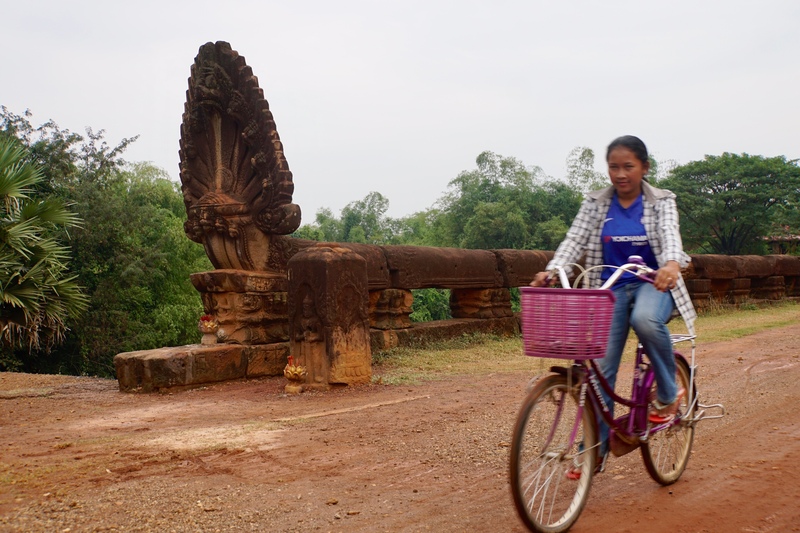 We stop for lunch and again to photograph bicycles crossing an old Khmer dirt bridge. 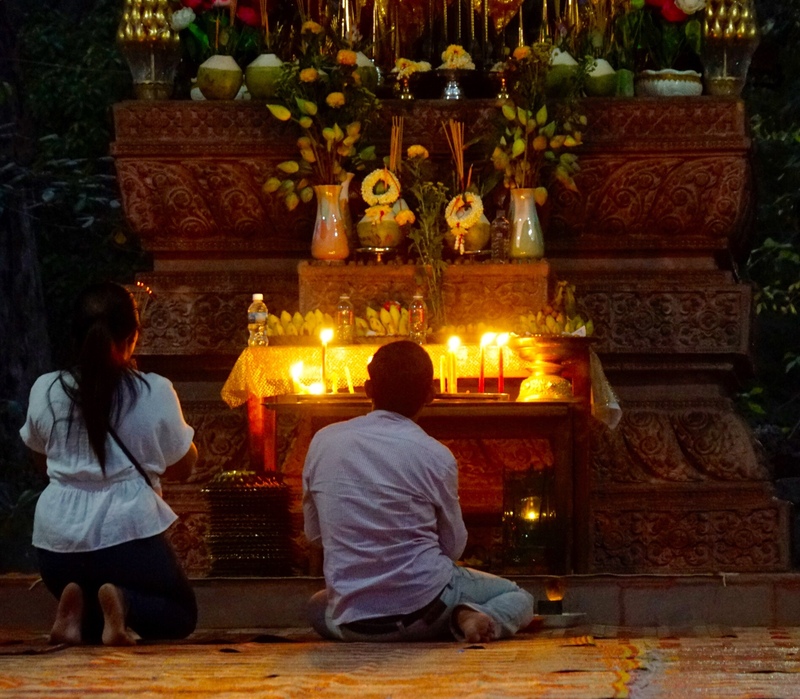 Once we reach Siem Reap, we visit the famous Angkor Wat for orientation and a sunset photo shoot. 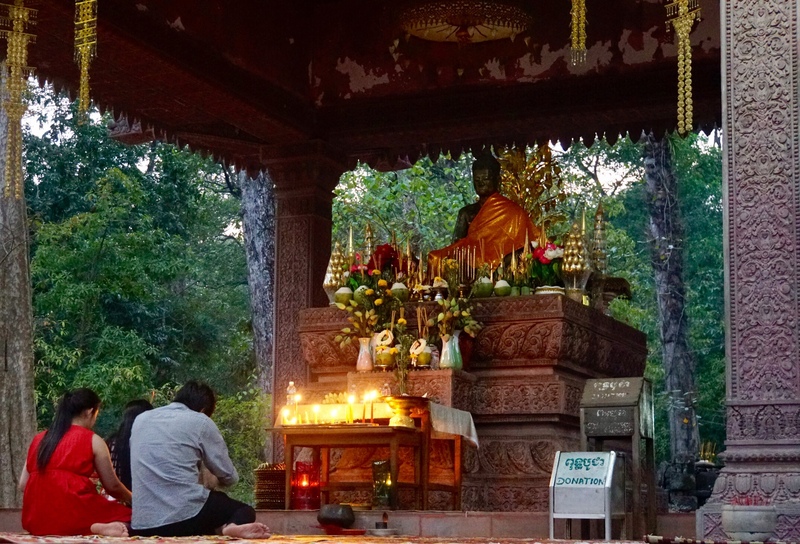 We are able to see the Victory Gate, walk through the forest along the wall to the Death Gate, all alone, and then drive to a spot where worshiping is being done, associated with a holiday for the new moon. This is all spectacular, clearly the highlight of our trip. 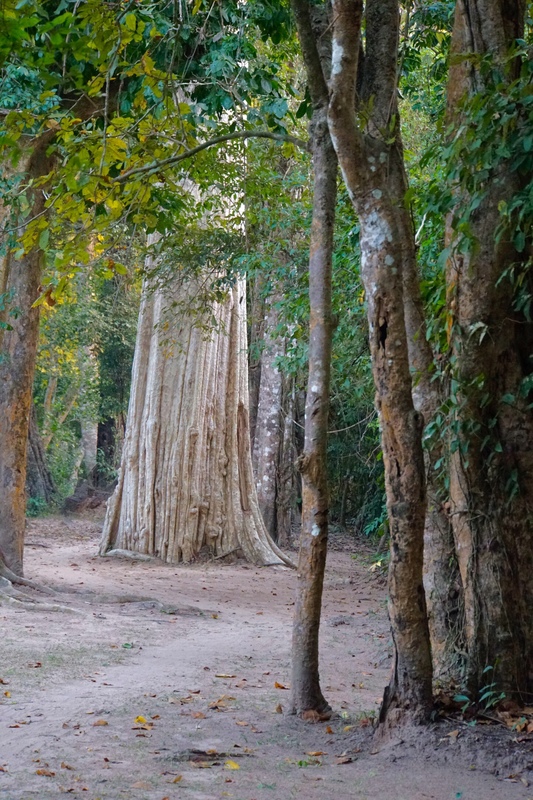 So we now have a first taste of why Angkor Wat is on everyone’s bucket list. From the Angkor Wat site, we take a tuk-tuk straight to dinner at a restaurant that features Mexican food, and margaritas. Quite exhausted, we head back to the hotel to sleep. 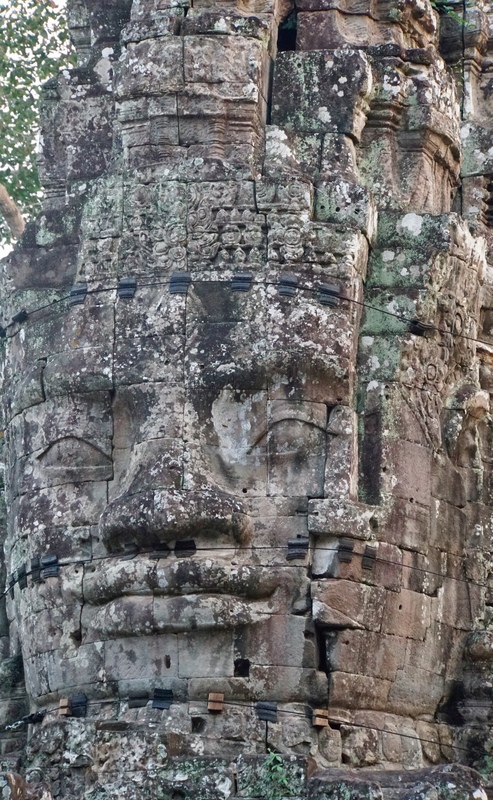 Here is a long, but I think, very interesting description of Angkor Wat (stolen from something called sacredsites.com). Since this is, by far, the single best known place we’re visiting, I’m giving you the full treatment, including a few snide, skeptical comments that I could not resist making. 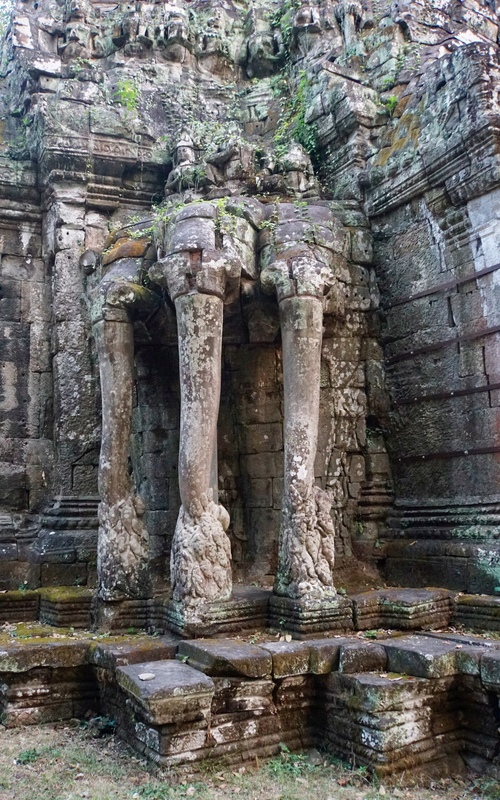 There are two great complexes of ancient temples in Southeast Asia, one at Bagan in Burma [which Carol and I saw five years ago, and loved], the other at Angkor in Cambodia. 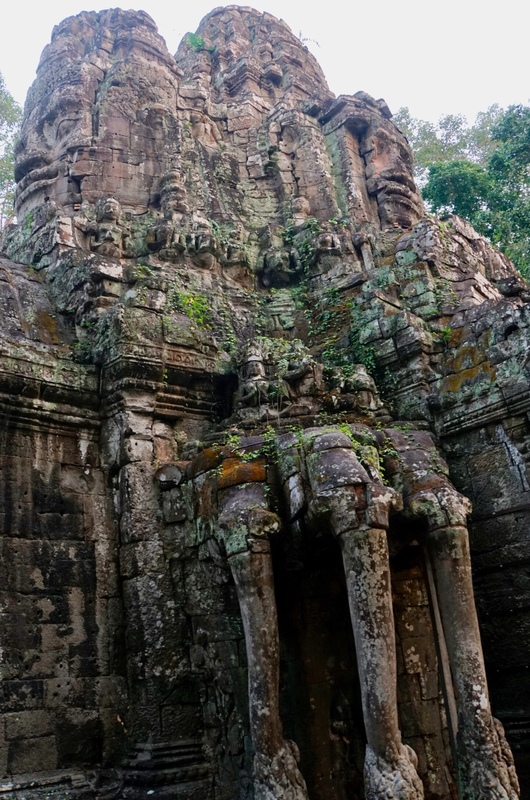 The temples of Angkor, built by the Khmer civilization between 802 and 1220 AD, represent one of humankind’s most astonishing and enduring architectural achievements. 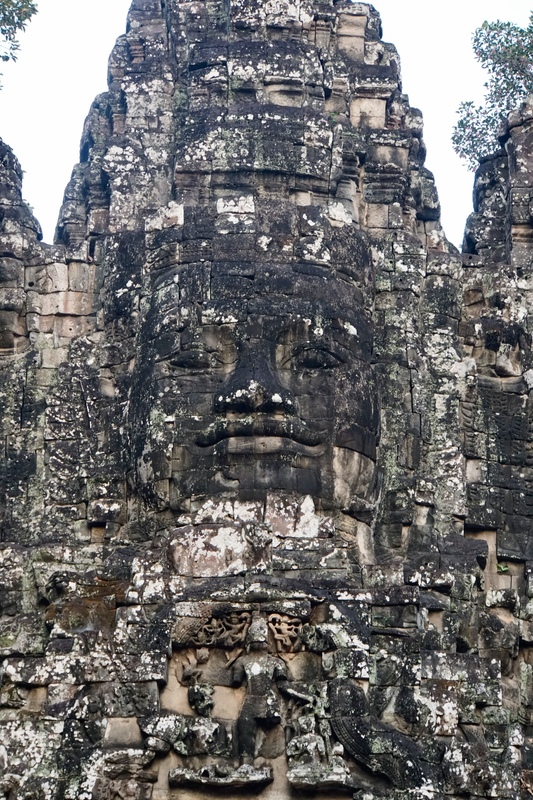 From Angkor the Khmer kings ruled over a vast domain that reached from Vietnam to China to the Bay of Bengal. 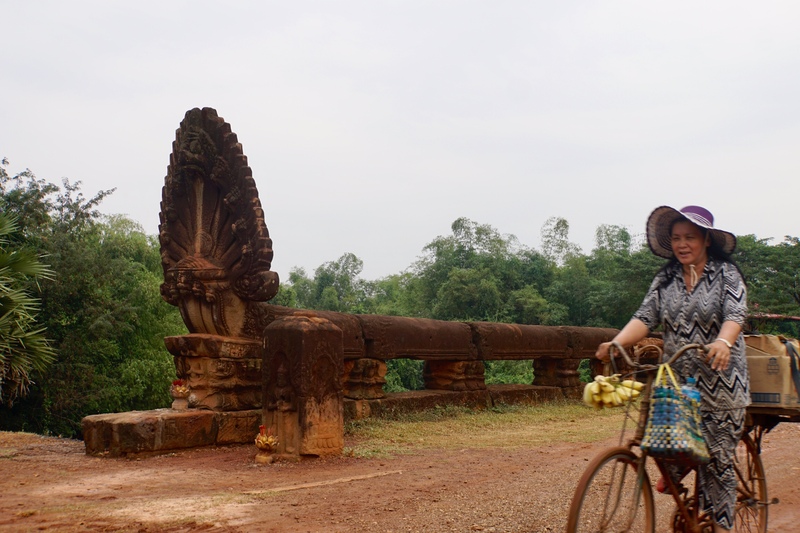 The structures one sees at Angkor today, more than 100 stone temples in all, are the surviving remains of a grand religious, social and administrative metropolis whose other buildings – palaces, public buildings, and houses – were built of wood and have long since decayed and disappeared. 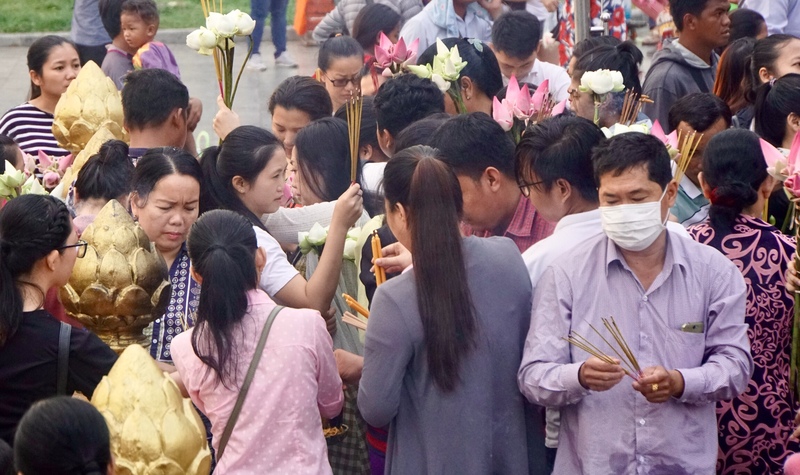 Conventional theories presume the lands where Angkor stands were chosen as a settlement site because of their strategic military position and agricultural potential. 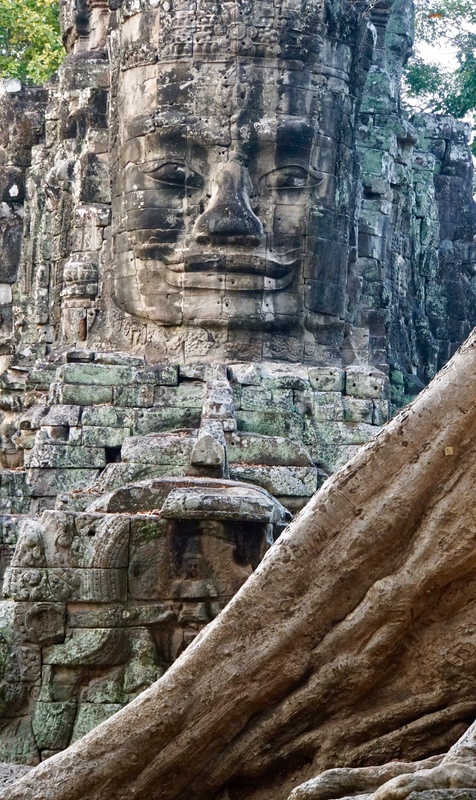 Alternative scholars, however, believe the geographical location of the Angkor complex and the arrangement of its temples was based on a planet-spanning sacred geography from archaic times. Using computer simulations, it has been shown that the ground plan of the Angkor complex – the terrestrial placement of its principal temples – mirrors the stars in the constellation of Draco at the time of spring equinox in 10,500 BC. 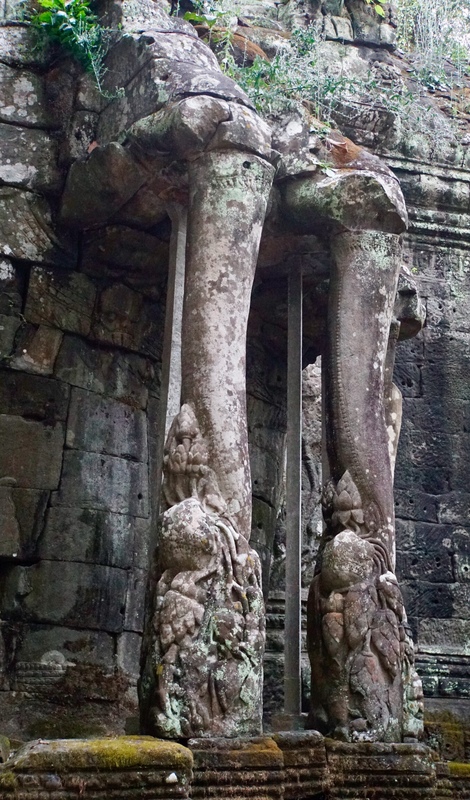 While the date of this astronomical alignment is far earlier than any known construction at Angkor, it appears that its purpose was to architecturally mirror the heavens in order to assist in the harmonization of the earth and the stars. [NOTE: aw c’mon, REALLY?] 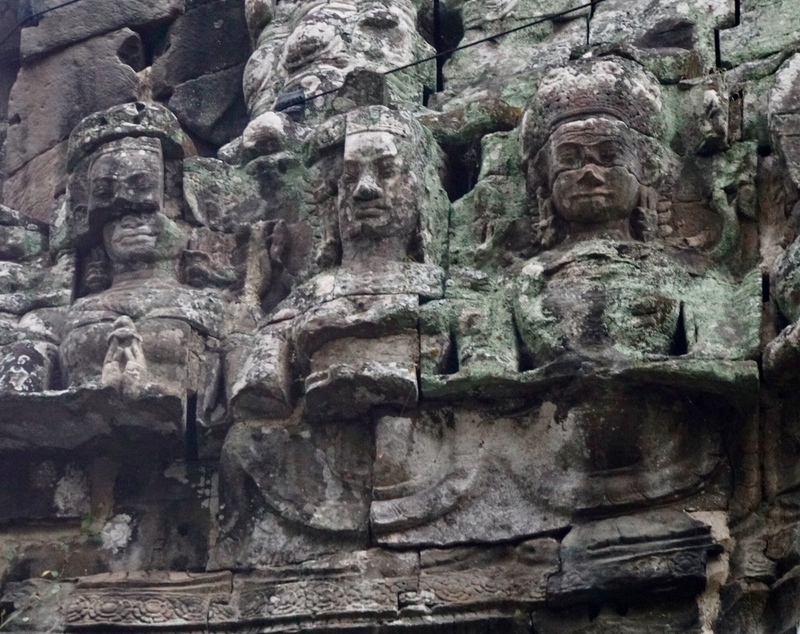 Both the layout of the Angkor temples and the iconographic nature of much its sculpture, particularly the asuras(‘demons’) and devas (‘deities’) are also intended to indicate the celestial phenomenon of the precession of the equinoxes and the slow transition from one astrological age to another. 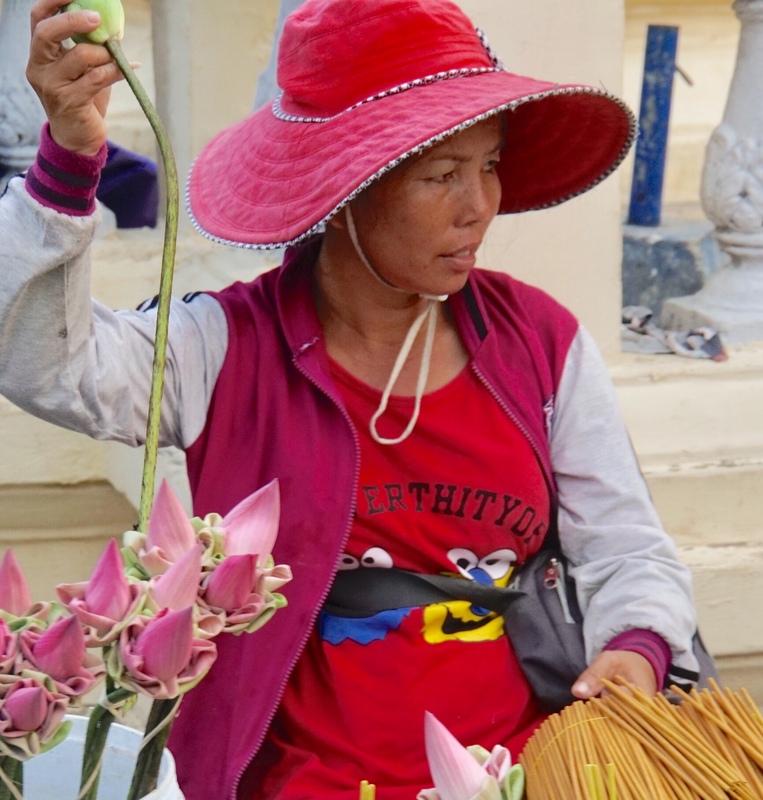 At the temple of Phnom Bakheng there are 108 surrounding towers. The number 108, considered sacred in both Hindu and Buddhist cosmologies, is the sum of 72 plus 36 (36 being ½ of 72). The number 72 is a primary number in the sequence of numbers linked to the earth’s axial precession, which causes the apparent alteration in the position of the constellations over the period of 25,920 years, or one degree every 72 years. 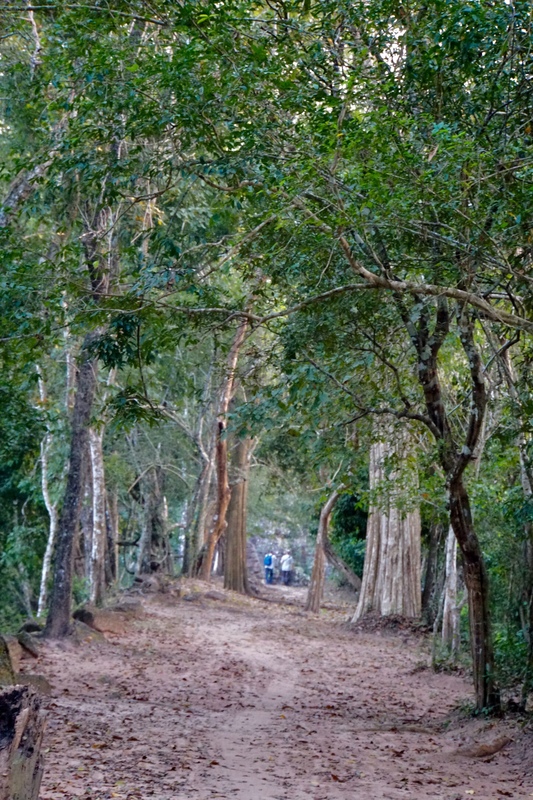 Another mysterious fact about the Angkor complex is its location 72 degrees of longitude east of the Pyramids of Giza. [NOTE: I repeat, REALLY?] 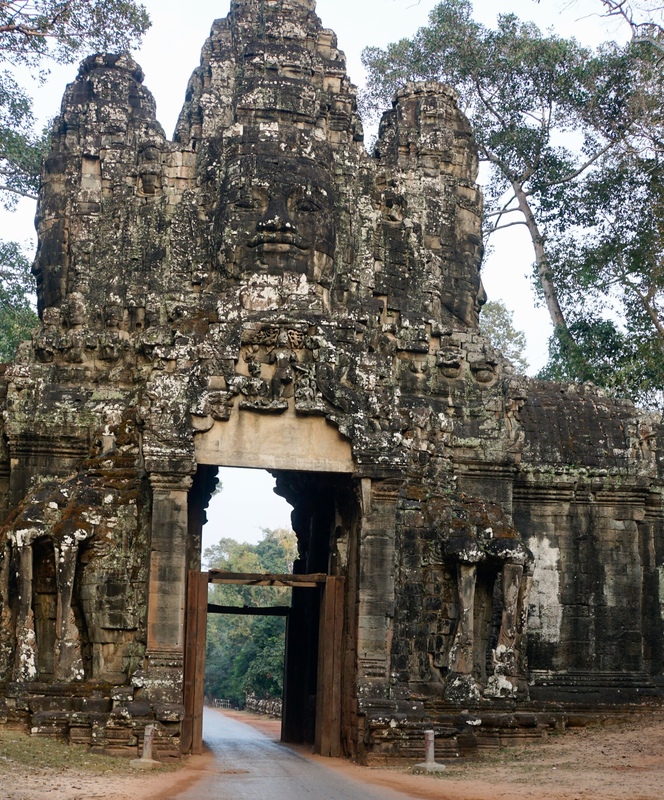 The temples of Bakong, Prah Ko and Prei Monli at Roluos, south of the main Angkor complex, are situated in relation to each other in such a way that they mirror the three stars in the Corona Borealis as they appeared at dawn on the spring equinox in 10,500 BC. [well, THAT’S certainly quite somethin, and lots of folks would have totally missed that]. It is interesting to note that the Corona Borealis would not have been visible from these temples during the 10th and 11th centuries when they were constructed. 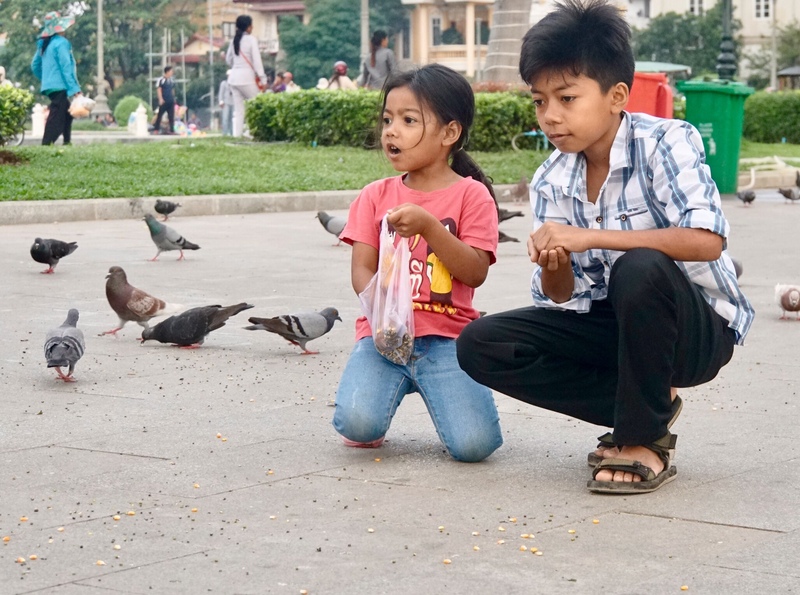 During half-millennia of Khmer occupation, the city of Angkor became a pilgrimage destination of importance throughout Southeastern Asia. 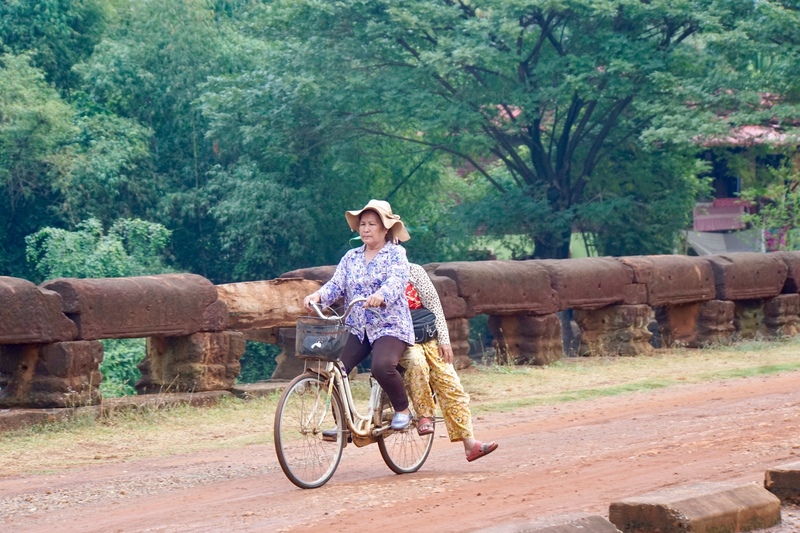 Sacked by the Thais in 1431 and abandoned in 1432, Angkor was forgotten for a few centuries. 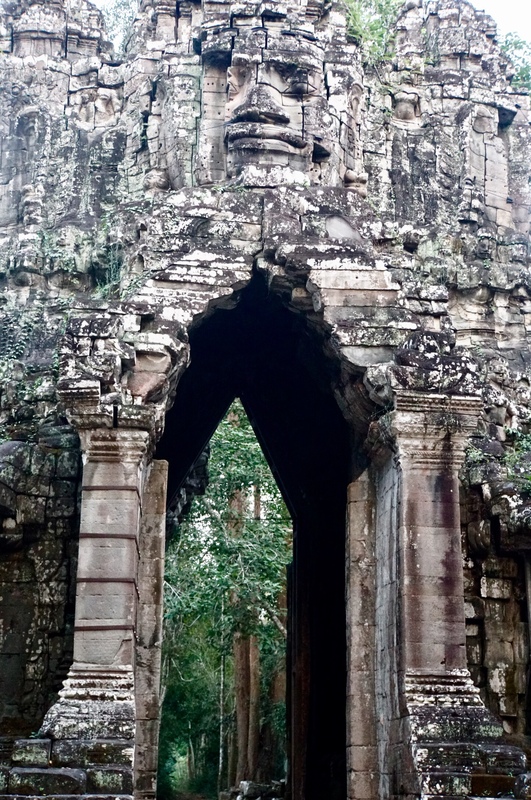 Wandering Buddhist monks, passing through the dense jungles, occasionally came upon the awesome ruins. 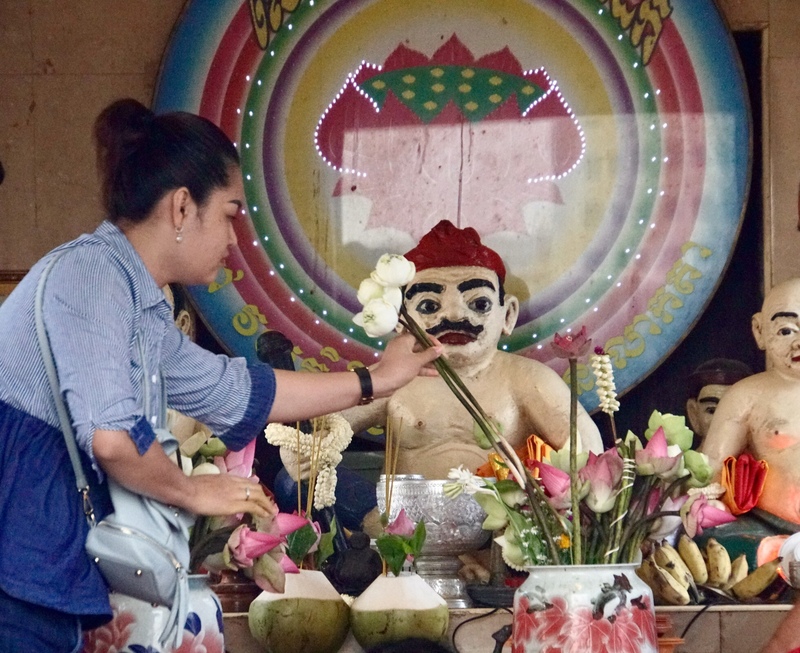 Recognizing the sacred nature of the temples but ignorant of their origins, they invented fables about the mysterious sanctuaries, saying they had been built by the gods in a far ancient time. Centuries passed, these fables became legends, and pilgrims from the distant reaches of Asia sought out the mystic city of the gods. A few adventurous European travelers knew of the ruins and stories circulated in antiquarian circles of a strange city lost in the jungles. 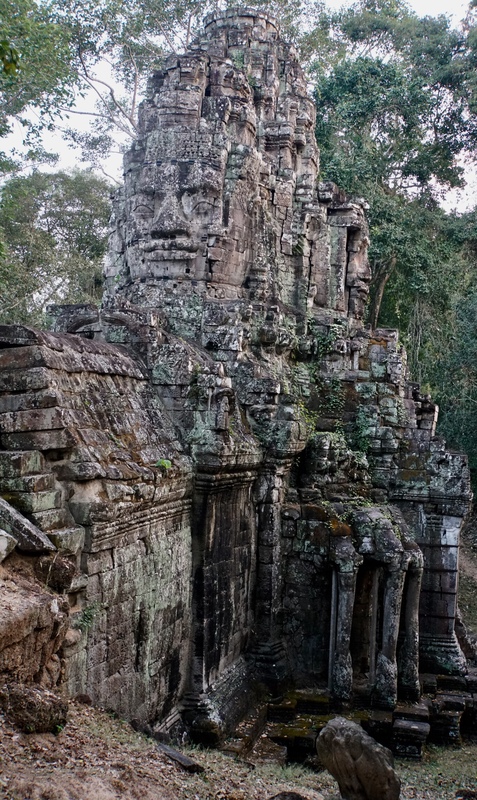 Most people believed the stories to be nothing more than legend, however, until the French explorer Henri Mouhot brought Angkor to the world’s attention in 1860. The French people were enchanted with the ancient city and beginning in 1908 funded and superbly managed an extensive restoration project. The restoration has continued to the present day, excepting periods in the 70’s and 80’s when military fighting prevented archaeologists from living near the ruins. 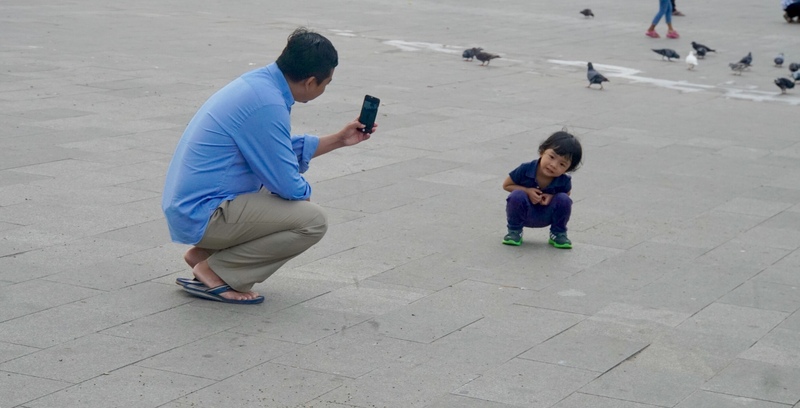 Great photos, Dadz! Glad there’s such a clear counterpoint to the low light of your trip. Love all your photos. 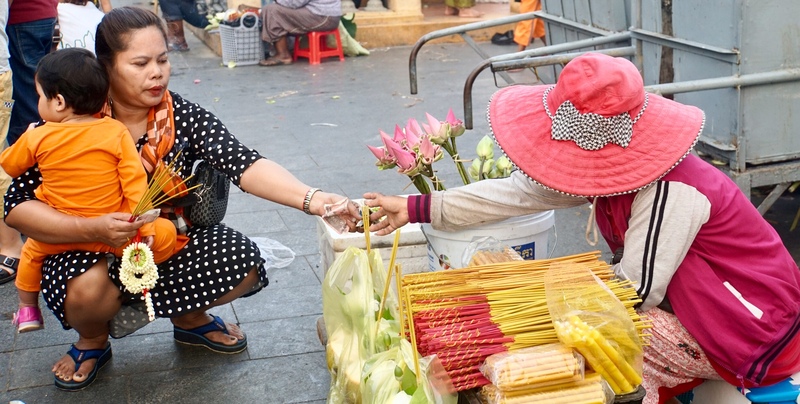 I also love PP as it does seem very real and so many people pass it up for only going to Siem Reap. Did you get to the museum in PP? Its amazing. Have a great time…. It’s like you are visiting another planet. Got to museum, but towards end of day, tired and did not allow adequate time. But still worthwhile. The “tarantulas for sale” caught my eye! 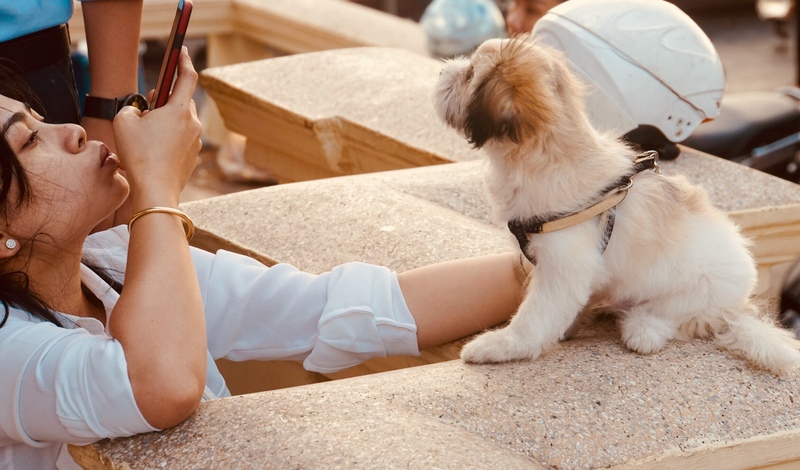 Did you take any photos of that? Eek! Fabulous. Thank you for all.